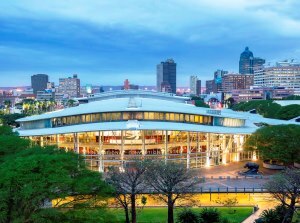 The Durban International Convention Centre (Durban ICC) has been named amongst the top 17 client-rated convention centres in the world by the International Association of Congress Centres (AIPC). The announcement of the finalists of the AIPC Apex Awards was made at the organisation’s annual conference held this week in London. The Centre was recognized as one of the 17 finalists for “Best Client-Rated Convention Centre” in the global competition and was notably the only convention centre in Africa to have made the final list despite several entrants from the continent. The AIPC Apex Award is made bi-annually in recognition of the highest client rating received by a convention centre on the basis of a comprehensive analysis of centre performance based on customer satisfaction surveys. An independent “blind” evaluation process carried out by Ipsos, a recognized international market research company, ensures an objective analysis of the data which addresses a series of factors including centre facilities, project management capabilities, catering and technical capacity. AIPC represents an elite association of international convention centres from 57 countries world-wide. Its mission is to encourage, support and recognize excellence in convention centre management and to maintain a range of programming that addresses this mission. The top honour went to the Valencia Conference Centre in Spain which was rated as the top client-rated conference centre in the world for 2018.